All demolition debris loads must comply with DEQ asbestos rules and regulations. The Oregon DEQ now requires an owner or operator to have an accredited inspector perform an asbestos survey before demolishing a residential building built prior to January 1, 2004. More information is available on the DEQ website. Riverbend supports recycling as a means to further waste reduction and preserve our natural resources. Children & pets must remain in vehicles at all times. All parties entering the landfill must have prior authorization. Stop at the scale house to inform scale attendant of your business. All loads must be properly covered and tarped. 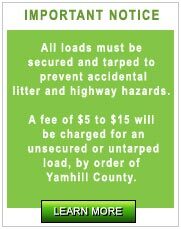 Do not exceed 15 mph on landfill roads. All acceptable items must be placed in the designated areas or containers. No smoking or loitering allowed. Dumping of hot ashes or burning materials is prohibited. Salvaging of material from landfill or recycling center is prohibited. Prohibited materials: hazardous waste, any liquids, closed containers or barrels, large dead animals.